Are you a Doctor Who fan? The BBC show’s been on TV for fifty years, with a variety of actors playing the lead, so we now find ourselves at the point where the people involved in the show, the people who write the stories and play the parts, grew up on a steady diet of the Doctor’s time-traveling adventures. 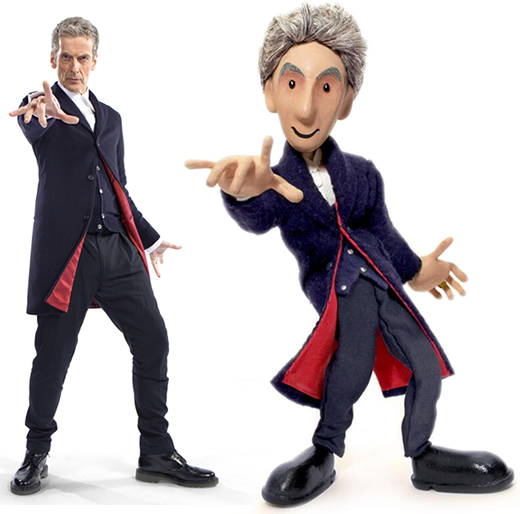 With fans in mind, there’s a considerable fan art and cosplay movement that has sprung up around Doctor Who — for instance, have you heard about the online puppet series, for example, in which the original is copied pretty well? Or what about the fan who was lucky enough to get involved in the new season after the producers saw his art on the internet? But wait…; if we approach all this thinking that there’s the show and then there’s the fans, or that the fan art is copying the original, then we’ve entirely missed an important point: for, as should have been evident from the opening quotes, the show is based on the show. That is, both Moffat and Capaldi are themselves life-long fans, which makes the show itself — the supposed original upon which the fans’ derivative art is based — fan fiction! 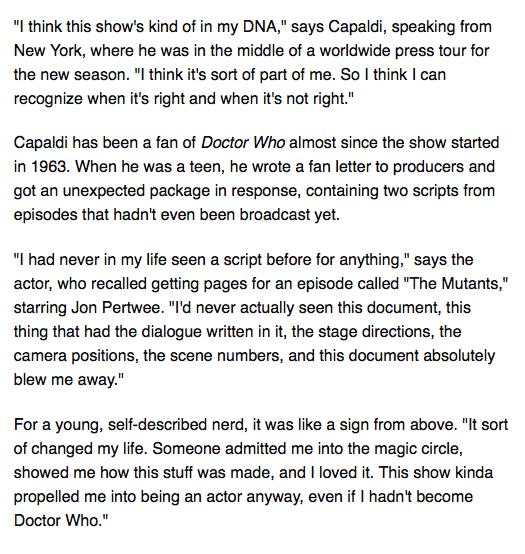 So “Nerd Fan is Now Doctor Who” might as well have been the headline announcing Capaldi’s role in the show. 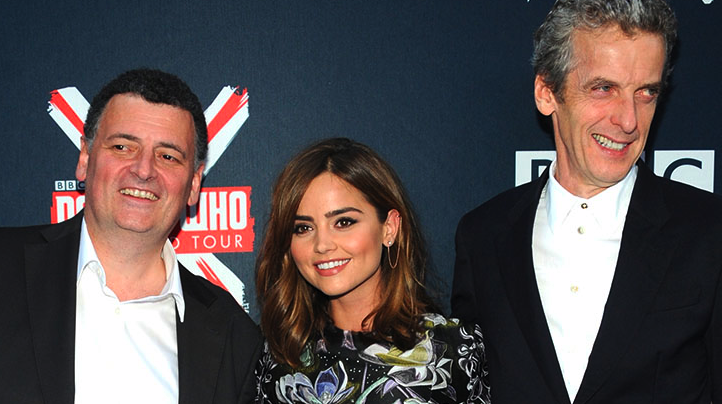 As for Moffat, the only difference between him and other fan fiction writers is that his scripts have considerably more of a budget backing them — making him the authorized fan, the institutionally legitimate fan, the one who attracts the corporate executive’s approval at the BBC and the advertisers’ dollars (and thus the fan who sold-out or cashed in?). And voila, if the show itself is but one more instance of fan fiction then what should be evident is that there is no original, no there there when we look at any cultural artifact, for it’s copies and borrowings wherever we look, with no definitive center or starting line to be found. For, come to think of it, even the original Doctor isn’t all that original, given how the very character of the Doctor is — at least to this fan — merely a mix of Sherlock Holmes and Peter Pan with a touch of Jules Verne thrown in, along with a heaping dose of nostalgia for the unfettered freedom of movement and intervention that once came with running an Empire. It’s derivation wherever we look. 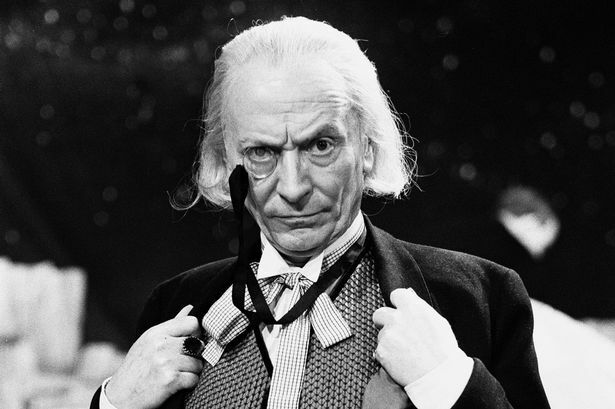 Since he watched the First Doctor’s (William Hartnell) regeneration into the Second Doctor (Patrick Troughton) at the end of the 1966 serial The Tenth Planet, Davies had “fallen in love” with the show and, by the mid-1970s, he was regularly writing reviews of broadcast serials in his diary. In fact, might we go so far as to see “fan fiction” as a term that merely legitimizes the products of just one generation back (thereby normalizing our present and our right to define what counts as the past), doing so as if it is the original reference point? For it turns out that, insomuch as they are themselves readers, all writers are fans of earlier characters that were themselves written by, yes, yet other fans who had read of yet other characters, making literature not something distinct or something to which fan’s respond but synonymous with fan fiction itself — it is a product of the fans who read it, suggesting that, when we take a closer look at that taken for granted distinction between readers and writers, we might see that all we have are readers.